Spitalfields, however, has its bright side. As yet machinery has not been invented to turn artist, or to guide the shuttle through the intricate niceties of the Jacquard loom, so as to execute designs. Figured and brocaded silks must still be done by hands, and those hands must be skillful. We knock at the door of a cheerful little house, extremely clean. We are introduced into a little parlour, where a young artist sits at work with crayons and watercolours. He is a student of the School of Design. He is at work on a new pattern for a table-cover. He has learnt to paint in oil. He has painted the portraits of his sisters – and of some one who I suspect is not a sister, but who may be a nearer one yet and a dearer one, and they decorate the room. He has painted groups of flowers. He shows us one that was in last year’s Exhibition at the Royal Academy, he shows us another that he means to finish in good time to send to the next Exhibition. He does these things over and above his regular work. He doesn’t mind work – he gets up early. There are cheap casts prettily arranged around the room, and it has a little collection of chapbooks of a good sort in it. The intrinsic worth of every simple article of furniture or embellishment is enhanced by a hundred-fold ( as it always may be) by neatness and order. Is father at home? Yes, and will be glad to see the visitors. Pray walk up! The young artist shows us the way up to the top of the house, apologising cheerfully for the ladder-staircase by which we mount at last. In a bright clean room, as pure as soap and water, and scrubbing, and fresh air, can make it, we find a sister whose portrait is down stairs – we are able to claim her instantly for the original, to the general satisfaction. We find also, father, who is at his Jacquard loom, making a pretty pattern of cravat, in blue upon a black ground. He is a cordial, sensible, intelligent a man as any one would wish to know. He has a reason for everything he says, and everything he does. He is learned in sanitary matters among other necessary knowledge, and says the first thing you have to do, is, to make your place wholesome, or you can’t expect to work heartily. Wholesome it is as his own pleasant face and the pleasant faces of his children well brought up. Industry, contentment, sense, and self-respect, are the hopeful characteristics of everything animate and inanimate in this little hose. If the veritable summer light were shining, and the veritable summer air were rustling, in it, which the young artist had tried to get into the sketches of green glades from Epping Forest that hang near father’s loom, and can be seen by father whilst at work, it could not be more cheering to our hearts, oppressed by what we have left. I meant to have had a talk with Mr Broadelle, respecting a cruel persistence in one inflexible principle which gave the New Poor Law a particular severity in its application to Spitalfields, a few years back, but which I hope may have been amended. Work in the stone-yard was the test of all able bodied applicants for relief. Now, the weaver’s hands are soft and delicate, must be so for his work. No matter. The weaver wanting relief, must work in the stone-yard with the rest. So, the Union blistered his hands before it relieved him, and incapacitated him from doing his work when he could get it. But, let us leave Spitalfields with an agreeable impression, and be thankful that we can. Dickens foresaw the end of Spitalfields as a location for mass-manufacturing while recognising the possibility for artists and designers who can create and sell their own personal work. A trend that is continued today by the young artists who show their work in all the tiny galleries here and the designers who sell their handiwork in the Upmarket and Backyard Market every Sunday. And just like Dickens’ young artist, many have day jobs to keep them going. 1851, the year of Dickens’ visit to Spitalfields, does not seems so long ago if you think that Paul Gardner‘s great-grandfather, James Gardner, began trading as Gardners Market Sundriesman in Commercial St in 1870, in the same building where Paul still sells paper bags today. 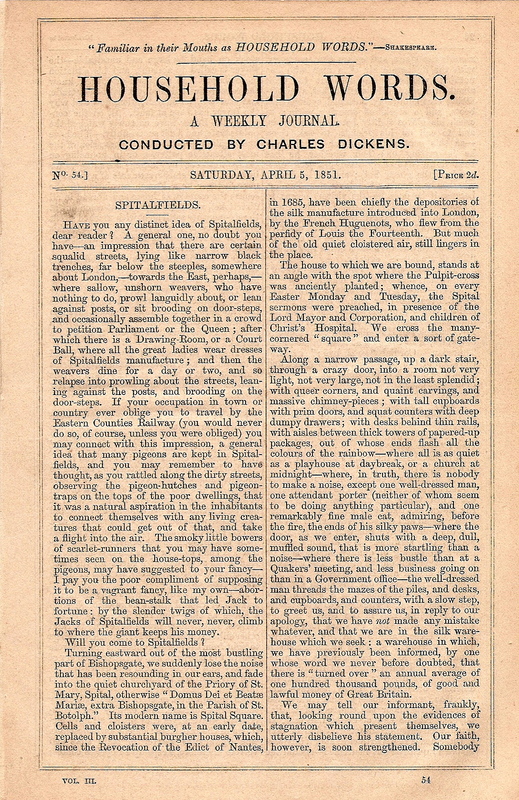 For threepence a week, Dickens’ readers received a twenty-four page copy of “Household Words” in the mail every Saturday morning, with features such as the article about Spitalfields you have just read, alongside installments of his latest fiction. 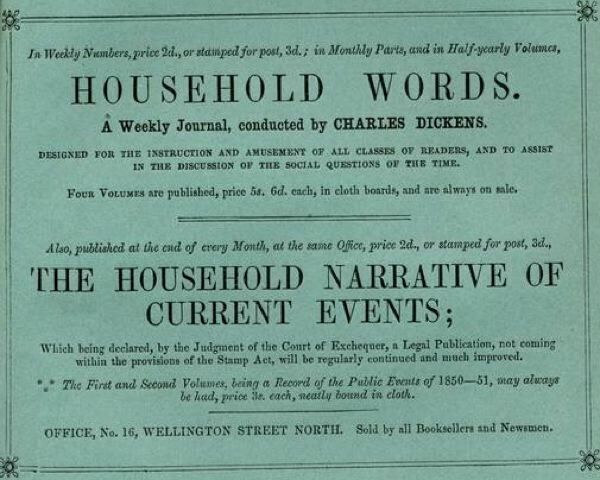 In “Household Words”, Dickens won the editorial independence from publishers that he long desired and created an independent open medium of communication with his readers who quickly amounted to more than forty thousand a week. Dickens’ project is one we can recognise, because I think we all know how he would have used the internet to pursue the same ambitions today. 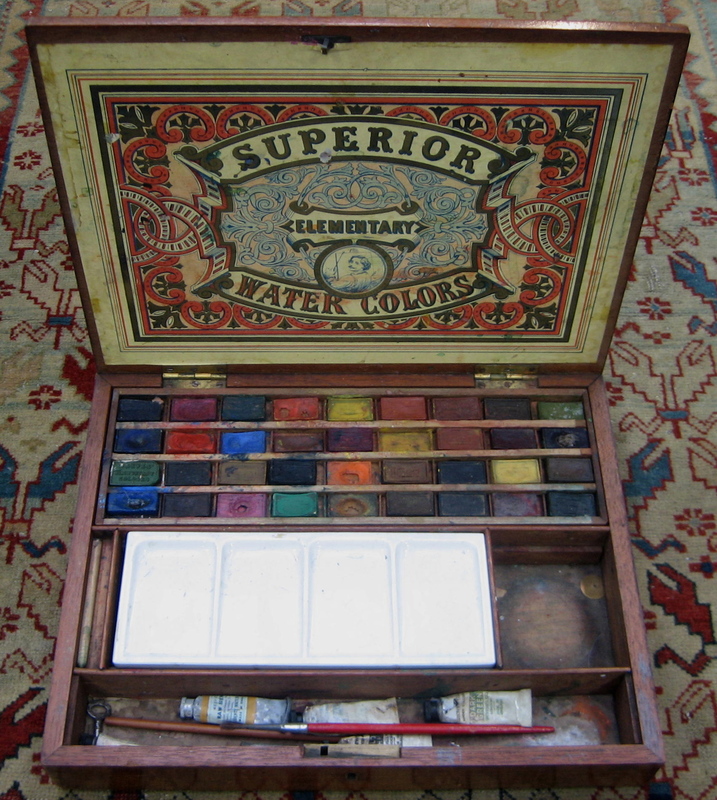 The artist’s box pictured above was kindly provided by Brian Oxley (featured in yesterday’s post) who is currently selling a collection of fine nineteenth century artist’s boxes, including this one, through his stall in the Spitalfields Antiques Market each Thursday. But not by a fine dusting of Arabian sand, brought in through the a/c. Time to clean my flat. Mrs Haversham had cobwebs and cake, I have dust and dates. I’ve enjoyed Dickens’ foray into Spitalfields. I happened to be reading Orwell’s essay recently, which pointed out that Dickens didn’t really know the working class and hardly wrote about them, indeed hardly ever wrote about “work”. This seems to be true from memory. Clearly, though, he wrote about work elsewhere, and engaged with the working class, just not in his fiction – “keeping them at arm’s length”, as it were. I wonder if this has something to do with the traumatising effect of his time spent in a blacking factory as a child, and the deep humiliation it caused him? The rest of London was processed and emerged triumphant in the Sparkler’s imagination … but not the working classes. Interested and intrigued, but not inspired, eh? Having read most of his novels, if someone asked me what Dickens thought of the poor, I’d only be able to reply, “He liked them as long as they were clean.” In other words as long as they didn’t let their state overwhelm them. Another fascinating post. Seeing Brian Oxley’s painting box made me think of Atlantis. Can we hope for a post on that fantastic treasure trove at some point? I have my uncle’s and my father’s painting boxes but with oil paint tubes still inside, unusable now of course as the boxes date from the 1930s and 1940s. I also have a pallette still smeared with oil paint that one of them used. When the boxes are opened the aroma is heavenly and transports me back to 1950s Manchester when I used to come upon my father’s box put away in a cupboard and would take a peek inside. He made me my own painting box which I still have and treasure. Stumbled upon your Blog by accident & like you too love the eclectic chaos that is the Thursday Collectors Market , I have been a regular visitor over the past 4 years and love the creative talent that the traders exude, it is a real treasure with a wonderful diverse mix not seen anywhere in London. In the late 1950′s I purchased a round wooden spice box from the Quaker area of Pennsylvania in an antiques shop in New York City. The box with SPICES stenciled on the lid contained round spice boxes inside each with a stenciled lid saying cinnamon, cloves, ginger, etc on the small top. When I got it home I opened the lid and a rush of spice fragrance enveloped me. It was heady. I keep the same box on my kitchen shelf to this day and when I want to be transported to a past of the aroma of baking spice cakes and perhaps a more simply life as well, I open the box and take a deep breath. It has not changed a bit.